When you think of Nepal you think of the mountains, especially the Everest, don’t you? You think of those intricately carved temples: some that withstood the massive Earthquake of 2015, some that were reduced to dust. You think of the friendly Sherpas and you think of picturesque landscapes, like the ones in Nagarkot. But when you think of Nepal do you think it to be a shopping destination? When I packed my bag for Nepal for the witnessing the Indra Jatra and the Kumari festival in Kathmandu, shopping was not even remotely on my priority list. (If I knew I would be carrying one empty bag just for the loot). Shopping is an integral part of my travels and I staunchly believe that one can forgo a little bit of luxury and save up for shopping at the destination. Collecting souvenirs from various countries is something that I absolutely recommend! For me, the process starts with looking up for cheapest air tickets to a particular destination, booking months in advance and splurging at the destination! So here’s a shopping guide of things you can buy at Nepal. What to buy, where to buy and what is a good rate! AND yes, Nepal has some absolutely fabulous, local stuff that you can take back home as souvenirs, gifts and memories! When I entered Thamel in Kathmandu, I thought it was one dusty market with only trekking equipment for sale. I realised how wrong I was when I saw the riot of colours: from vibrant dreamcatchers to colourful lanterns, the market came alive with bright hues. Here are some of my TOP recommended buys at Thamel. If you are a stationary hoarder, Thamel is the place to be. 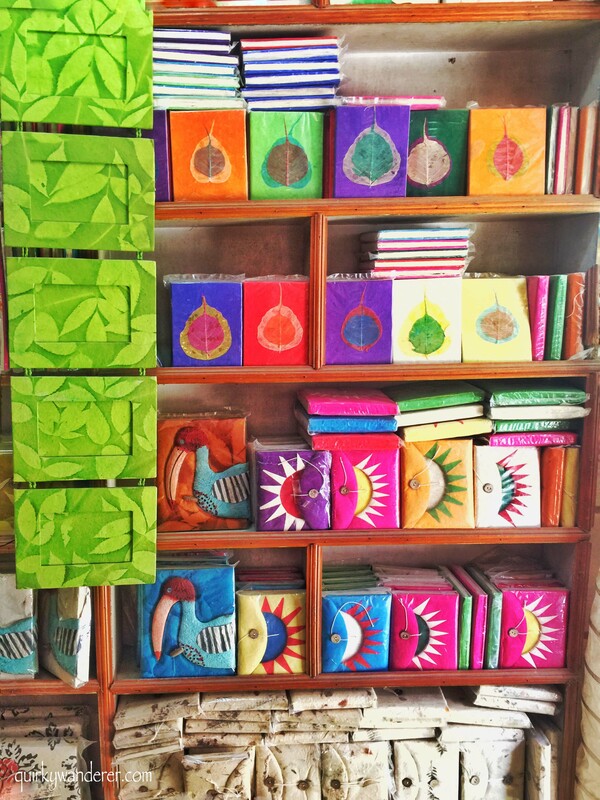 Colourful paper diaries, lanterns in various shapes and notebooks with unique designs flood the market. Dig a little deeper and you’d find beautiful themed calendars made of handmade paper and jewellery boxes too. With the advent of social media, paper cards seem to be fading, but if you are old school (like me) you’d love the display of hand painted cards that make for ideal gifts. The best part of buying handmade paper items is that these are indigenous items from Nepal and are very easy to pack and light to carry! Dairies/ Notebooks: Nepali Rupee 350 onwards depending on the size. Cards: Nepali Rupee 160 onwards. Staying in Mumbai, I really don’t need woollens. But Thamel is one place that can lure you with funky coloured woollens that you CANNOT resist. From rainbow coloured shrugs, to bright coloured combinations of socks, gloves and hats, you will find reasonable deals here. Most of this market is flooded with trekking gear and equipment and there are plenty of shawls sold dirt cheap as well. If you feel you aren’t game to take back a bulky woollen wear, opt for the colourful hand gloves and socks. Most of these are sold at Nepali Rupee 250 per pair. If you have a kid or know a kid do NOT miss the gorgeous, super cute woollen shoes in Thamel. The shapes are super cute and the colour contrasts are amazing! There are also sling bags and backpacks for kiddies. Kid backpacks: Nepali Rupee 800 onwards. I was introduced to these gorgeous things by my super talented friend Zainab who makes them herself and whenever I got to see these beauties hanging in shops at Thamel, I remembered her. You get them in all sizes and colour combinations. From miniature key chain sizes to giant sizes. Another local product is Hemp bags that are made in Nepal. Mostly beige in colour with a patch of other colours, these bags look quirky and have LOTS of space. They have these in various sizes and some shopkeepers even have sling bags and pouches made of Hemp. Price range for a large Hemp Bag: Nepali Rupee 1100 onwards. Nevertheless they add to the colours of Thamel and make for great souvenirs! Especially the boxes and trays! Painted Madubani products: These are tea boxes! Because these are hand painted these are generally a little expensive but you wouldn’t mind paying a little extra for gorgeous art! Another must stop place for shopping in Nepal is Bhaktapur. This heritage town is the cultural capital of Nepal and is known for its art and handicrafts. Out of the four squares in Bhaktapur, the pottery square and the Dattatreya square are shopping hubs. Even in the other squares: Durbar square and Taumadi, you are likely to find shops selling the most artsy stuff that will blow your mind and money away! Pottery: The pottery square boasts of local pottery that is made and painted right in front of your eyes. Watch the local artisans at work as they bake their ware in the sun and dry it in the open. The square offers not just ware to shop and take home but also a great opportunity to interact with the artisans and take photographs of the process. Fancy unique footwear? Bhaktapur has these absolutely famous jute footwear sold at throwaway prices and made by locals. May not be over the comfy but good as flip-flops in summer! Nepal is full of artistic wooden handicrafts, some painted some intricately carved. In Bhaktapur, there are many shops selling beautifully carved antiques, in the Taumadhi square. Some can get heavy but there are miniature versions as well. What caught my eye were these small sized doors which were hand painted. Price: Nepali Rupee 10500 onwards. There are various shops selling masks as well. Some Buddhist figures, some Hindu gods like Ganesh. Most of these masks are displayed at entrances of houses. In Bhaktapur at the Dattatreya square and the Taumadhi square, Brass handicrafts are sold at various shops. These are brass ware and souvenirs made of brass. Definitely not the ideal ‘gift’ to fly back with given the weight but a great option for those who love antiques! All over Nepal especially in Kathmandu and Pokhara, gems and jewellery are found in abundance. Some of these are locally produced and some is procured from India. Most of it is beaded jewellery, some with stones: precious and semi precious. Nepal is also known for its Rudraksh beads. Note: you need to be absolutely sure of and have knowledge of stone before buying them. When you visit Boudanath in Kathmandu, you will find various stalls selling Buddhist souvenirs. These include prayer flags of various sizes, incense sticks, (many variants) and prayer bowls. You can also buy these from Thamel. Almost every shop stocks these! The knives on the wall! Nepal markets have a variety of other souvenirs too. From the famed Nepali Khurpi (knives) which are displayed in fun fanfare on the walls to Nepali puppets (which make authentic gifts) to Himalayan soaps. The fragrances of the soaps are extremely unique and the one that caught my fancy was rhododendron! Of course there are the more touristy magnets for people who love to collect them! Have you been to Nepal? What did you shop and which items do you recommend? Let me know in the comments below! Most of the shopkeepers in Thamel bargain. Some don’t. It’s best to visit a few shops before you zero in on your buy, as MOST shops have more or else similar stuff. In places where the artists work and directly sell, like Bhaktapur pottery square its best to not haggle and give them the due for their work as the prices are already reasonable and you wouldn’t do that in a mall, would you? Visit Thamel in the day. The market opens at around 10.30 am. At night the place turns into a hub of dance bars. Indians often have this query if the new 500 and 2000 notes are accepted. Yes they are. But it is preferred to carry a few 100s as well. Change will be returned in Nepali Rupees so its best you carry 500s over 2000s. Thamel is in Kathmandu and Bhaktapur is a 45 minutes drive from Kathmandu. There are daily flights to Kathmandu from various cities in India. Chief operators include Air India, Indigo airlines, Nepal airways and Jet Airways. woow divyakshi, these is so helpful guide. Love how you’ve captured the brightness and vivid colour, as well as the earthen tones! What a buyer’s paradise awaits. I love collecting masks and unique gifts from far off places. I’m so glad I saw this as I’d never seen this side of Nepal before! Thamel is a shopper’s dream Divy. You did an awesome job recapping your buyer’s journey through the place. Being full time digital nomads, my wife and I rarely buy stuff but we did drop some dough on a few things in Thamel, when we visited Kathmandu in 2013. All types of stuff and you are right; those colors are mesmerizing. I too was stunned at the range of goods for sale in this vibrant part of the city. The colors of everything are so vibrant! What a fun place to be. When Vasu completed the EBC, he stayed back in Kathmandu for a few days. And he brought so many gifts for everybody including genuine Saligrams, singing bowls, wooden masks etc. I was in Kathmandu on October and I did not realise that there are so many collection of crafts and clothing to buy 🙂 With Nepal’s rich cultural history and religious influence, I’ve seen a lot of monasteries and temples. I have to admit that shopping in Kathmandu was not one of my favorite hobbies during my journey 🙂 I will keep in mind few places and stuff to buy for my next trip to Nepal. You are totally right, Everest is the first thing that always comes to mind when I think of Nepal. But all these colorful souvenirs are beautiful! I especially love the paper lanterns and the jute bags. Like you, I always make sure to bring home something local to remind me of my travels. Thank you very musch for such a detailed guide. We are going to Nepal next summer, but I am already planning all the possible things. This article about shopping in Nepal will be definetely useful for us. He he.. Even I did shopping here like a big loot.. So I got that very girly bag, some paintings, magnets, clothes and more. I think I would need two empty bags to fill all these “loot” because everything is so gorgeous, especially the woolen shoes for kids! I am not much of a shopper. However, during my first trip to Nepal, I shopped so much that things were falling off my bag, haha. I did buy those paper machie lamps! I can see myself wanting to buy everything if i am in Nepal! all the colours and beautiful things. Although we are digital nomads so we have to try to not buy too much! I love local handicrafts, pottery and beautiful handmade cloth and paper souvenirs like these. You have provided a complete guide to shopping in Nepal here. And believe me, I am going to make the most of it when I happen to visit Nepal. Yes Nepal conjures up images of the majestic Himalayas and not shopping. But I can see the wide range of local handicrafts and goods available. I think shopping in some places also promotes sustainable tourism and contributes in a small way to the development of the region as compared to shopping in glitzy malls. Though personally I am not one for shopping on my travels apart from window shopping, I would not mind getting a souvenir or two. 2 of my friends have visited Nepal and got me some gorgeous jewelry from there. I’m yet to go… But OMG, look at your loot!!!! I should carry a lot of cash and a laaaarge spare bag, when I head to Nepal. You’re right- I definitely don’t think of shopping when it comes to Nepal! I love the look of those paper lanterns, such bright, pretty colours! I haven’t been to Nepal before. Bhaktapur looks like a great place and I think I’d buy postcards (i am quite oldschool too) and also I’d buy those beautiful tea boxes. And antiques, I love antiques (if they are affordable). You had me at shopping! I like to bring back souvenirs from around the world, to remind me of all the amazing places I’ve been. Loving all the colorful shops. Wow, those are really cool handicrafts! Hopefully I’ll have the chance to buy some of those when I finally make it to Nepal. Nope, I would never have thought of Nepal as a shopping destination, but what a range of products! I would probably pick up a couple notebooks, and those help bags look really cute. I don’t suppose they’re waterproof? When Vasu had gone to Nepal for EBC trek, he stopped for a few days in KTM on the way back. He is not a great shopper but still bought a whole lot of handicrafts and masks from Thamel. I am now tempted to go too. Wow so much to visit and I love the idea of shopping, such a colourful place and great place for souvenirs to take home- it must be difficult not to be over baggage when flying back home. This is such a vibrant post and it made me happy. I will remember to carry an extra bag for shopping when travelling to Nepal. I don’t know what I will surely buy and what i will leave. But everything is so damn attractive. That wooden painted doors are so beautiful and my husband is fond of antiques too. The shopping in Nepal looks so colourful! I would love to buy a handmade notebook. Actually I would like to buy MANY! Very informative post for people wanting to shop in Nepal. What lovely pictures. We never did any shopping in Nepal but now we feel we missed out!